Pellet matrix Pellets are small cylindrical pressed bodies. The raw material is made up of residual wood such as wood shavings and sawmill residuals left in their natural state. Typical wood pellet manufacturers are large saw and planing mills where the raw material is produced as a by-product and where synergies are thus created in the production cycle. Six to eight cubic metres of saw and planing shavings are required to produce one ton of pellets. The quality of the raw materials used has a decisive influence on the quality of wood pellets. In order to ensure the quality required, various quality controls are carried out from preparation through to the finished wood pellets. In addition, scrupulous preparation and processing of the raw material is of extreme significance. The production of wood pellets therefore places great demands on the manufacturing process. The factors involved here result from the differing moisture contents of the woods and sizes of the planing and sawing shavings. Differing types of wood place varying demands on a pellet press. Hardwoods such as beech and oak require a higher pressure than softwoods and coniferous woods for example. In order to achieve a consistent quality of raw materials with a defined residual moisture content therefore, the shavings are initially dried and freed from contaminants. After preparation of the raw material it is conveyed by an auger to the presses. Special rollers, press the material through the holes of the flat bed matrix. The hot pellets are cut to the specified length and cooled with ambient air. Wood consists mainly of the constituents lignin and cellulose. As a result of the pressure during the pressing process, the lignin becomes adhesive and encases the cellulose fibres. 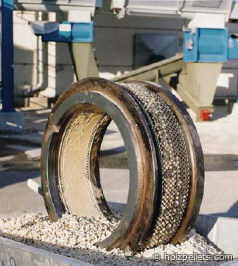 By this means pelletization is possible without the addition of binding materials. The abrasion resistance of the pellets is provided by the addition of press additives such as starch and flour. This natural-state admixture is allowable up to a percentage of 2%. As a rule however no more than 0.5% press admixture is actually added. Before storage in a silo, as well as before loading into road tankers, the dust and fines are sieved off. By this means it is ensured that the proportion of fines is maximum 1%. The input of energy required for manufacturing and processing pellets from dry wood residuals is extremely low compared to natural gas or oil. Thus the expenditure of energy for manufacturing and processing pellets amounts to only 2.7% of the final energy, whereas for natural gas this figure is 10% and for domestic fuel oil as high as 12%. If damp shavings or forestry wood residuals are used for pelletization the energy expenditure then increases as a result of the higher moisture content.